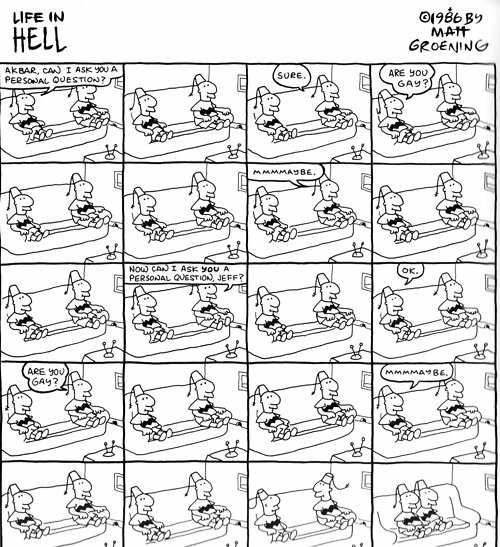 Outside of a few Far Sides and Calvin & Hobbes, this actual Life in Hell panel ranks up in the top 5 of the best cartoons ever published. I have no real post today, other than it is National Coming Out day - and you know how I feel about that as I've written about it a few times, like last year and in 2010, 2009, and a cool video from OSU's Baker Hall West back in 2007. Still, little warms my cold cold heart more than Akbar and Jeff. They have the best 'coming out' ever. I remember this cartoon; I remember these two. Thank you for a smile today.